The organ is untouched, except for tuning slides and tuning in Equal Temperament. In 2005 the organ was repaired by Martin Goetze and Verners Kalacis, chiefly dirt, and mouse and woodworm damage. There is a single manual and a pedalboard which acts on the lowest octave of manual keys. The stop knobs are arranged in a horizontal row, three each side of the keyboard. The bellows occupies the space at the bottom of the organ. 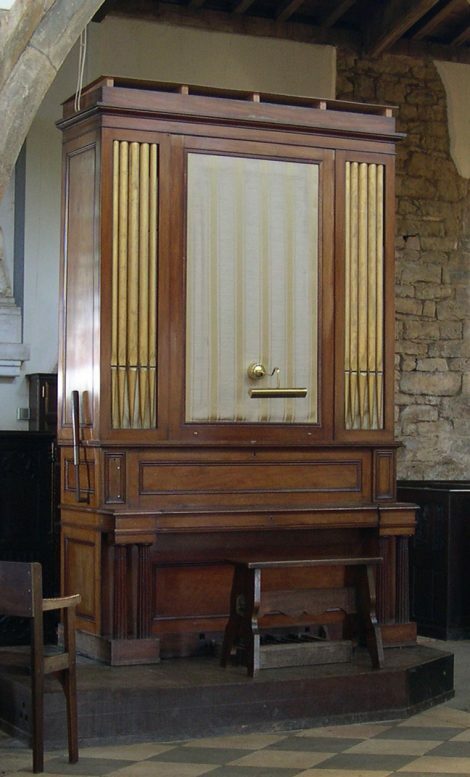 A single fold wedge feeder operated by a hand lever at the bass side of the organ supplies the horizontal rise reservoir, which has one inward and one outward fold. It is also possible for the organist to pump the feeder by foot, the iron roller providing two possible positions for the pedal, either side of the pedalboard. In 2005 Martin and Verners added an electric blower inside the Victorian dais, chopping out woodworm-ridden wood in the process. The manual and foot blowing is still operational. This instrument was made as a ‘finger or barrel organ’, and although it is now only possible to operate it with the keyboard, evidence remains of the barrel section: the space for the barrels, just behind the music desk, the pull-down holes (and presumably the pallets), and the case door on the treble side where the barrels would have been slid out, the back of the little door still listing the tunes supplied. In 2007 a barrel was found in the church, riddled with woodworm.